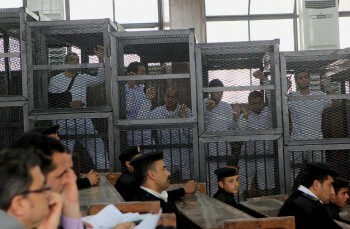 Journalists Baher Mohamed, left, Mohamed Fahmy, center, and Peter Greste appear in court on March 31, 2014, during their trial in Cairo, Egypt. Photo (crop): AP Photo/Heba Elkholy, El Shorouk, File. Notable Egyptian-Canadian journalist Mohamed Fahmy has spent his career in conflict zones covering major stories for outlets including New York Times and CNN. In December 2013, during his time as Egypt Bureau Chief of Al Jazeera International, Fahmy made international headlines when he and two colleagues were arrested by Egyptian authorities and charged with falsifying news and conspiring with banned fundamentalist group the Muslim Brotherhood. 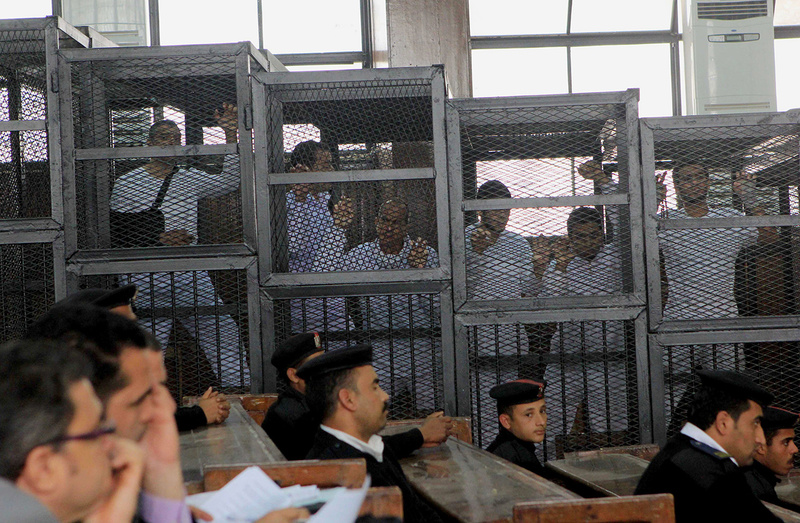 He was incarcerated for 438 days alongside ISIS terrorists and jihadists, during which time Egypt’s government faced mounting pressure to release the three journalists. In September 2015, the government pardoned Fahmy, allowing him to return to Canada, where he joined UBC’s School of Journalism for a term as a visiting professor. 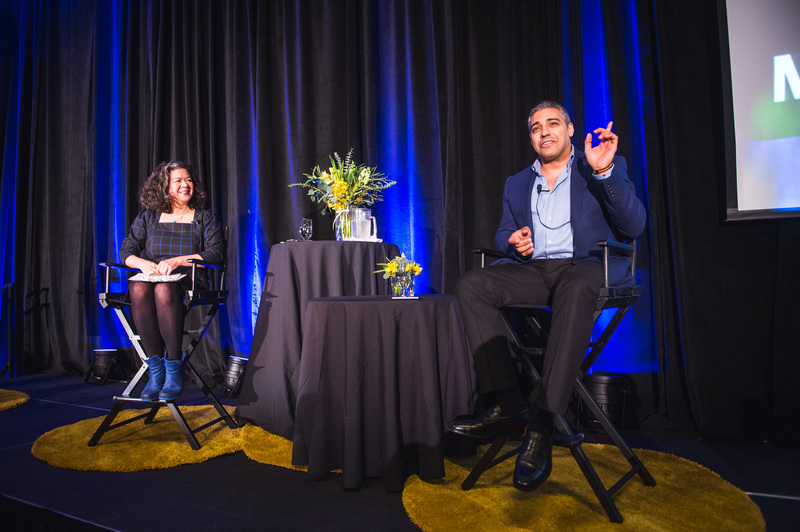 On January 19, 2016, Fahmy was interviewed by Margaret Gallagher of CBC Radio One’s Hot Air at the Robert H. Lee Alumni Centre in Vancouver. Below are some highlights from the interview, followed by a podcast of the entire event. The Beijing-based couple tackling air pollution. Chris Friesen, BA’88, is heading a new approach for the integration of refugees into Canadian society. Thank you for all you do for everyone. We need role models and leaders like you to motive us and to motivate our new PM to take action as you have pointed out. Thank you again. I am moved personally and yet feel impotence at the same time in responding to this world phenomena. You are showing us the way to deal with this savagery! What Mr. Fahmy suffered in Egypt was unconscionable and I have great respect for his fortitude, his commitment to a free press and his determination to build systems that will prevent this travesty of “justice” happening to others in the future. What I find somewhat troubling is his tendency to place more blame on our federal government for his suffering than on the media giant that sent him to undertake the assignment which got him into so much trouble. Where was Al Jazeera while its employee was being so gravely mistreated, and why does Mr. Fahmy vent more of his rage and indignation at our government rather than at his employer? Did any Al Jazeera executive respond to his dire circumstances as well as Canada’s ambassador to Egypt did? Mr. Fahmy’s view of the Charlie Hebdo case in Paris is also somewhat troubling: of course journalistic cartoonists should have the right to draw whatever they want — but that case raised questions more of editorial taste than of press freedom. Freedom of the press remains alive and well in France and other advanced societies, but the judgment of those who enjoy and benefit from this freedom to publish is sometimes questionable. This is important for all of us to here this story. Will be recommending these articles for our students at Eric Hamber for their social justice 12 class. The average citizen in a democratic country has power with the freedom of speech and expression to protect the rights of those disenfranchised and persecuted in our world. We are fortunate to live in Canada. This is very good, hope there will be a book out.